Now, getting into a deeper level of criticism (! ), I find the book very uneven and overall quite disappointing. (Even missing in its statistical foundations.) Esp. given my initial level of excitement about the topic! Second, the depth of the statistical analysis in the book is often found missing. For instance, Simpson’s paradox is not analysed from a statistical perspective, only reported as a fact. Sticking to statistics, take for instance the discussion of Lindley’s paradox. The author seems to think that the problem is with the different conclusions produced by the frequentist, likelihood, and Bayesian analyses (p.122). This is completely wrong: Lindley’s (or Lindley-Jeffreys‘s) paradox is about the lack of significance of Bayes factors based on improper priors. Similarly, when the likelihood ratio test is introduced, the reference threshold is given as equal to 1 and no mention is later made of compensating for different degrees of freedom/against over-fitting. The discussion about p-values is equally garbled, witness the above quote which (a) conditions upon the rejection and (b) ignores the dependence of the p-value on a realized random variable. The chapter on statistical controversies actually focus on the opposition between frequentist, likelihood, and Bayesian paradigms. The author seems to have studied Mayo and Spanos’ Error and Inference to great lengths. (As I did, as I did!) He spends around twenty pages in Chapter 3 on this opposition and on the conditionality, sufficiency, and likelihood principles that were reunited by Birnbaum and recently deconstructed by Mayo. In my opinion, Chang makes a mess of describing the issues at stake in this debate and leaves the reader more bemused at the end than at the beginning of the chapter. For instance, the conditionality principle is confused with the p-value being computed conditional on the null (hypothesis) model (p.110). Or the selected experiment being unknown (p.110). The likelihood function is considered as a sufficient statistic (p.137). The “paradox” of an absence of non-trivial sufficient statistics in all models but exponential families (the Pitman-Koopman lemma) is not mentioned. The fact that ancillary statistics bring information about the precision of a sufficient statistic is presented as a paradox (p.112). Having the same physical parameter θ is confused with having the same probability distribution indexed by θ, which is definitely not the same thing (p.115)! The likelihood principle is confused with the likelihood ratio test (p.117) and with the maximum likelihood estimation (witness the above quote). The dismissal of Mayo’s rejection of Birnbaum’s proof—a rejection I fail to understand—is not any clearer: “her statement about the sufficient statistic under a mixed distribution (a fixed distribution) is irrelevant” (p.138). This actually made me think of another interpretation of Mayo’s argument that could prove her right! More on that in another post. One of the first paradoxes in the statistics chapter is the one endorsed by the above quote. I found it intriguing that this interval could be of the form x±η|x| with η only depending on the confidence coverage… Then I checked and saw that the confidence coverage was defined by default, i.e., the actual coverage is at least the nominal coverage, which is much less exciting (and much less paradoxical). Most surprisingly, the book contains exercises in every chapter, whose purpose is lost on me. What is the point in asking to students “Write an essay on the role of the Barber’s Paradox in developing modern set theory” or “How does the story of Achilles and the tortoise address the issues of the sum of infinite numbers of arbitrarily small numbers”..?! Not to mention the top one: “Can you think of any applications from what you have learned from this chapter?” Erm…frankly, no! 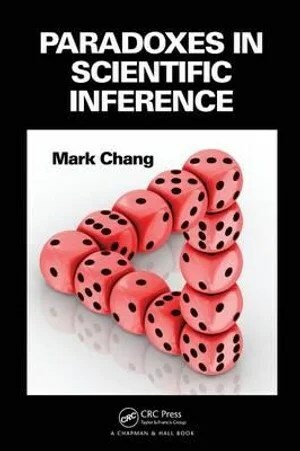 This entry was posted on November 23, 2012 at 12:12 am and is filed under Books, Statistics, University life with tags Allan Birnbaum, book cover, book reviews, CHANCE, Deborah Mayo, Dickey-Savage ratio, Error and Inference, Fermat, Likelihood Principle, p-values, paradoxes, scientific inference, Shigeo Fukuda, Simpson's paradox. You can follow any responses to this entry through the RSS 2.0 feed. You can leave a response, or trackback from your own site. Professor Christian Robert reviewed my book: “Paradoxes in Scientific Inference”. I found that the majority of his criticisms had no foundation and were based on his truncated way of reading. I gave point-by-point responses below. For clarity, I kept his original comments. Because the response is hundreds of lines long, I have turned it into a full post, to appear soon.